Named by Complex Magazine as one of “30 Designers Under 30 to Watch”, Mr. Caesy Oney is grabbing attention with unique interpretations of leather goods and varsity jackets alike. We joined Caesy (and canine companion, Boogie) in his studio to discuss design, inspiration, and fuzzy backpacks. Montana is known for many things, but breeding fashion designers is not one of them. In Caesy Oney’s case, Montana made an exception. And make things he does. 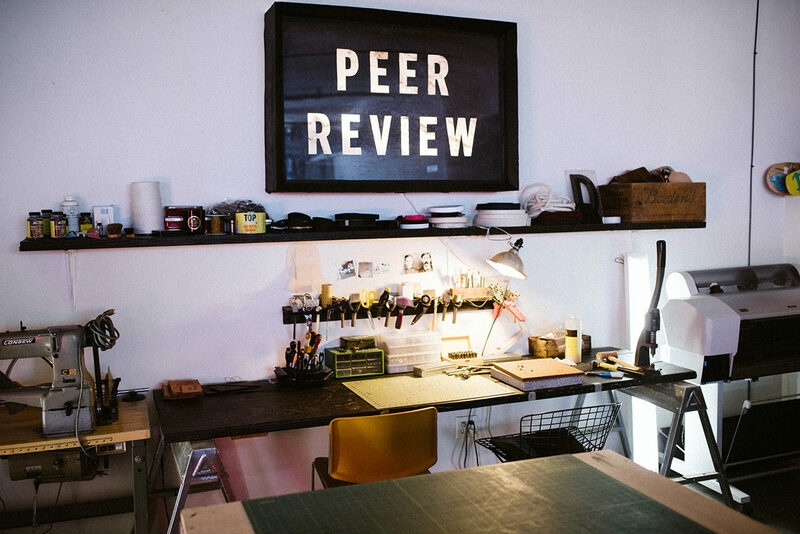 The 30-year-old creative is a multidisciplinary photographer, designer, and hands-on maker of everything from leather bags and tee shirts to varsity jackets and sneakers. 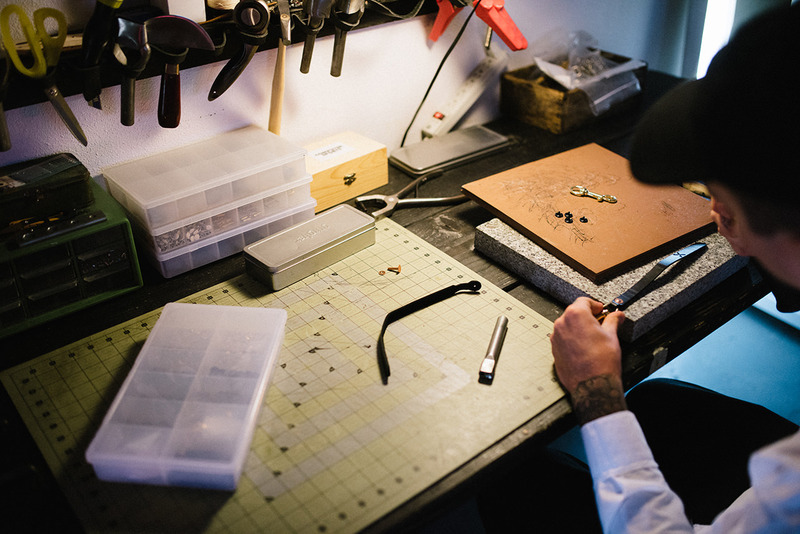 In his own words, “I really like to make stuff.” And, as Caesy’s success proves, he’s damn good at it. Caesy graduated in 2008 from PNCA with an art degree in photography, but his creative focus shifted shortly thereafter. “I had started sewing in college, and I became really fascinated with how objects are actually produced.” Caesy’s focus would quickly shift from standing behind the lens to creating the objects in front of it. Moving back to Montana after college, he picked up odd jobs while developing what would go on to become his first brand: Draught Dry Goods. 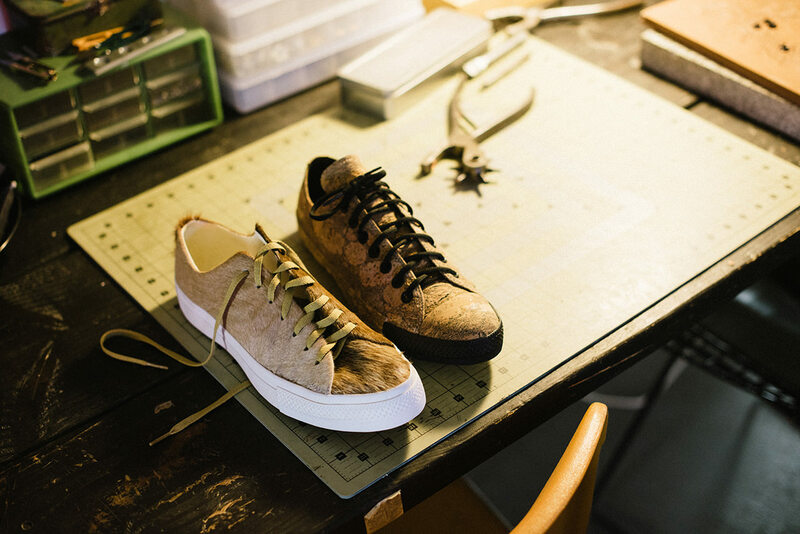 Moving back to Portland six months in, Caesy found himself sewing 60 hours a week, but also surrounded by a community of creatives that inspired him to spend more time designing. And perhaps even more quickly than selling bags was an escalation of tension — a tension that seems to arise in all of Caesy’s creative endeavors: to produce or to design. 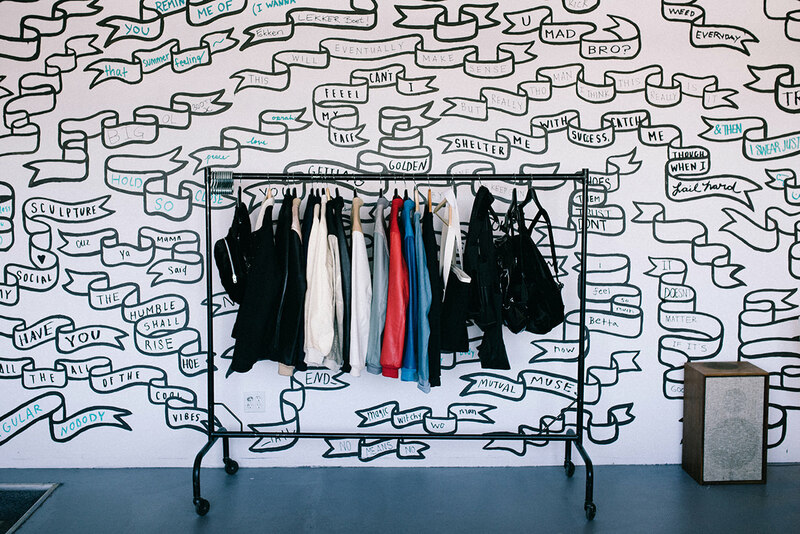 “It’s hard to budget for design time when you’re getting paid to produce,” says Caesy. “It’s a balance. When you’re paying all of your bills with production, you’re tempted to make compromises.” But this “tension” of production and design is, for Caesy, an influential force that seems to make both more achievable than less. 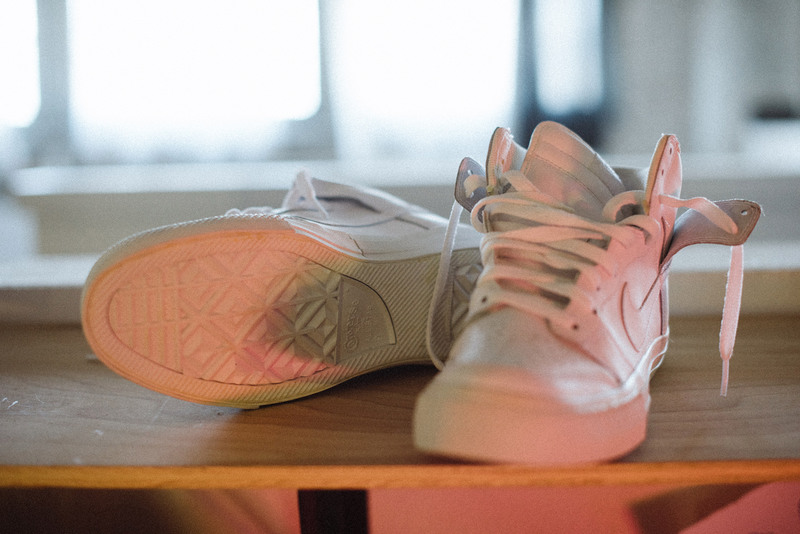 Compromise has never been on Caesy’s radar — he is a creative in the truest sense of the word. But he also has a knack for creating things that people want to buy. Draught alone has been independently sold in over 50 shops worldwide, including Hong Kong, Australia, Singapore, Canada, Thailand, The United Kingdom, and over 20 shops in Japan including Journal Standard, Tomorrowland, and Isetan. 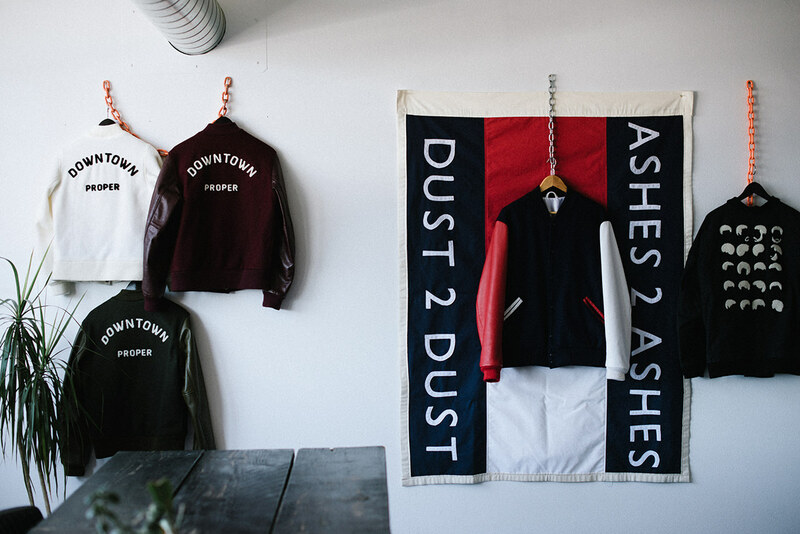 But over time, “getting there” has evolved into longer term collaborations as well, one of which developed into an exceptional line of handmade varsity jackets with friend and colleague Aaron Settlemier. Caesy smiled as he spoke of his relationship with Aaron. “He’s a great dude. 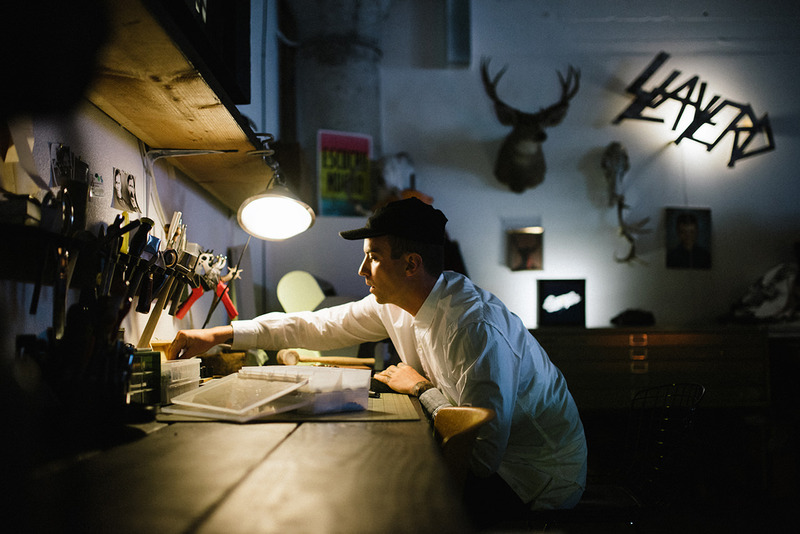 I met Aaron when I was looking to produce a jacket for Draught.” Aaron Settlemier runs his family’s Portland-based factory as a third generation jacket maker (the factory is aptly named “Settlemier’s Jackets”). It wasn’t long after their initial conversations that Caesy approached Aaron about starting a project together. It was a great match and the two became fast friends, the partnership maturing into what would become Odd Fellow Company. 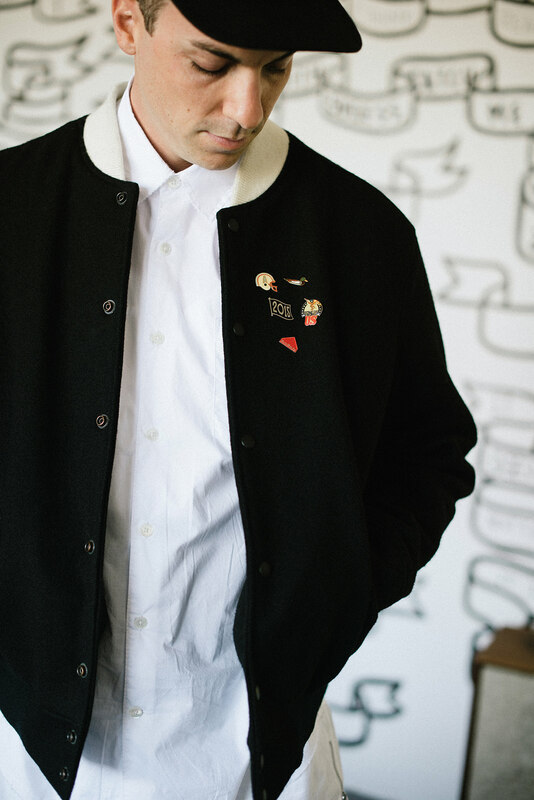 The cornerstone piece in the Odd Fellow collection is a slim-fit varsity jacket, cut-and-sewn in the 6,000 square foot Settlemier factory, barely a 15 minute drive from Caesy’s studio. “The designs are my passion. And the production of them is not only Aaron’s family passion but his business and his livelihood and his family legacy.” A legacy that, if the OFC jackets are any proof, is being honored in spades. 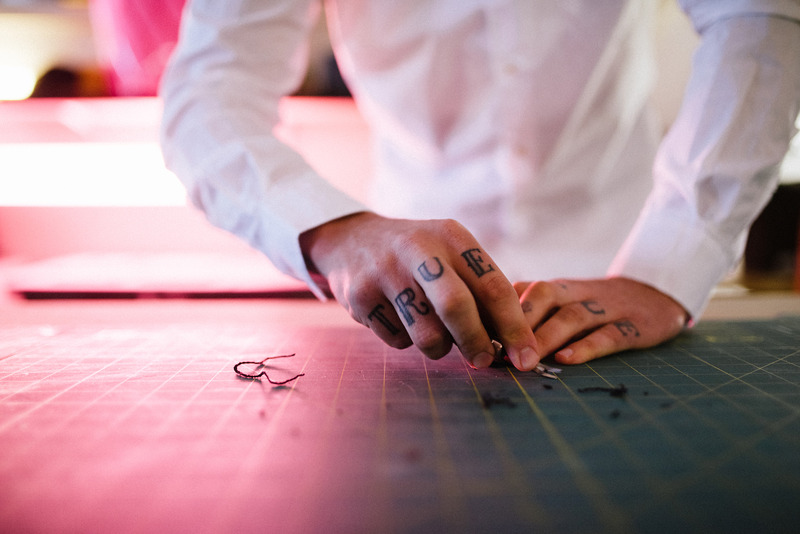 The highest quality garments we’ve encountered are those in which there is an uncommonly close relationship between the owners and the products produced. Odd Fellow is no exception. And on top of OFC and Draught Dry Goods, Caesy Oney also has a “day job”. Admittedly, this is no ordinary day job. Prototyping for most companies is a time consuming process: a concept originates from a design studio in the states and then gets sent overseas for pattern and prototyping, then back over for review. This back and forth process repeats for an undefined number of iterations. Shortening those transitions allows for faster and arguably better innovation. “Making cool stuff really fast.” Caesy’s explanation of his position is a perfect example of his subjective paradigm at play. What is an unheard-of talent at rapid prototyping is, to him, another day at the office. And it is perhaps because of his subjectivity that he’s found so much success. The matter-of-fact perspective on his skillset results in a unique ability to solve problems with pattern and construction and materials with especially creative solutions. One thing that is not matter-of-fact about Caesy, however, is his immense respect for the opportunities he’s been given. While he’s quick to share confidence in what he’s created, he’s quicker to honor those inputs that have helped him achieve such success, be it principles he’s learned from art school or the inspired designers around him, with whom he works on a daily basis. One quickly gathers that between Nike, Draught Dry Goods, and Odd Fellow Company (not to mention time with his girlfriend, two dogs, and enjoying a good meal), Caesy’s “work” is anything but.